Heat oven to 375°F. In large bowl, stir Cookie Cup ingredients until soft dough forms. Shape into 36 (1 1/4-inch) balls (about 1 tablespoon each); place in ungreased mini muffin cups. Bake 8 to 10 minutes or until set when lightly touched in centre. Cool in pan 5 minutes; press indentation into centre of each with end of wooden spoon, cleaning off end with paper towel when needed. Remove from pan to cooling rack; cool completely. Meanwhile, in medium bowl, beat cream cheese, 2 tablespoons butter and the vanilla with electric mixer on low speed about 1 minute or until well combined. Slowly add icing sugar, beating on low speed until well blended. Increase speed to medium; beat 1 minute. Spoon filling into resealable food-storage plastic bag. Snip off corner of bag. Gently insert cut corner of bag into indentation in each cookie cup. Squeeze bag to fill opening, about 2 teaspoons per cookie cup. Store covered in refrigerator. 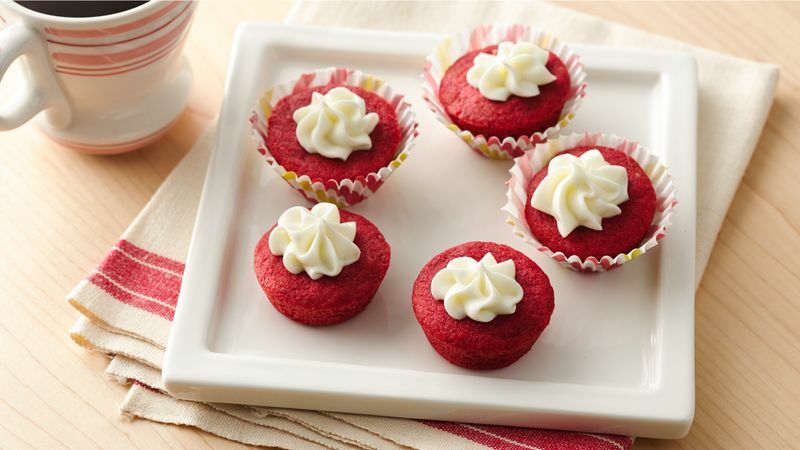 Save time during the busy holidays by freezing baked unfilled cookie cups in airtight containers. Thaw when needed, and top with cream cheese filling. For a more polished look, spoon frosting into decorating bag fitted with star tip. Pipe frosting on top of each cookie cup. For an easy garnish, reserve cookie crumbs that cling to the spoon handle when creating the indentations; sprinkle over filling.